(Central Islip, N.Y., May 5, 2017) – The three-time Atlantic League champion Long Island Ducks today announced the signing of right-handed pitcher Eric Gagne. The 10-year MLB veteran begins his first season with the Ducks and 16th in professional baseball. 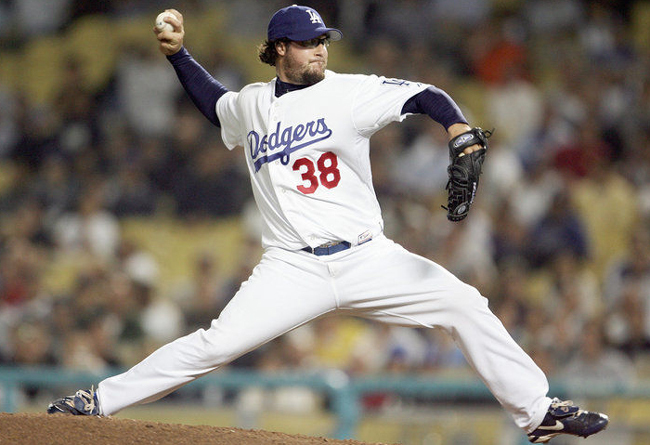 Gagne spent eight seasons with the Los Angeles Dodgers from 1999-2006 and also pitched for the Texas Rangers (2007), Boston Red Sox (2007), and Milwaukee Brewers (2008). He made three consecutive All-Star teams from 2002 to 2004 and won the 2003 National League Cy Young Award. The right-hander tied the National League record with 55 saves in 2003 while also posting a 1.20 ERA and 137 strikeouts in 82 and one-third innings. The Montreal native holds the MLB record for converting 84 consecutive save opportunities, doing so between August 26, 2002 and July 5, 2004. In 402 career MLB appearances, Gagne collected 187 saves and struck out 718 batters in 643.2 innings pitched.